Andy Mulligan's goal set Wexford on the road to victory. 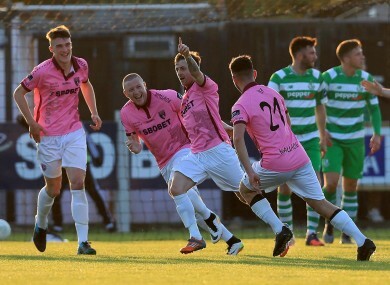 WEXFORD YOUTHS MOVED to ninth in the SSE Airtricity League Premier Division after securing back-to-back wins following a deserved 2-0 win at home to Shamrock Rovers. Goals from Andy Mulligan and Chris Kenny helped Shane Keegan’s side to the win on a night where his opposing manager Pat Fenlon will no doubt have been left frustrated despite having good spells of pressure during the game. Despite being second best for the opening exchanges, Wexford Youths had the first real chance. Midfielder Eric Molloy charged down David Webster’s attempted clearance after just 10 minutes, but as the ball broke kindly toward goal, he couldn’t find the target when one-on-one with Shamrock Rovers keeper Craig Hyland. At the other end, Shamrock Rovers had a great chance of their own to take the lead. Gavin Brennans’s ball from the back was misjudged by the Youths defence as they looked to head clear, but Gary McCabe’s powerful strike was pushed away by keeper Graham Doyle as it looked destined for the back of the net. After a lively start from both teams, the opening goal arrived after 19 minutes. Youths defender Gary Delaney did brilliantly to steal possession from Rovers striker Gary Shaw with a sliding tackle on the edge of the Rovers box. Delaney found Andy Mulligan in the penalty area and he fired a low strike past keeper Craig Hyland to give the home side the lead. Shaw had a shot in anger at the other end as he forced Youths keeper Doyle into a great save. Rob Cornwall almost levelled the tie before half-time when he got on the end of Killian Brennan’s free kick but he headed just wide of Doyle’s post, before Shaw set up Dean Clarke but he couldn’t find the target. The pace of the first half didn’t relent in the second as the home side almost doubled their lead. Striker Paul Murphy controlled and held off the attention of Webster, before playing the ball for Eric Molloy but he fired just wide of the far post. Rovers duo McCabe and Brandon Miele both had good strikes saved by Doyle before the home side doubled their lead. Shane Dunne was picked out on the right by Paul Murphy, and his low cross found the onrushing midfielder Kenny and he fired home into the bottom corner to secure the points. Wexford Youths: Graham Doyle; Craig McCabe, Gary Delaney, Ryan Delaney, Aidan Friel; Andy Muligan, Eric Molloy (Conor Whittle (90+2), Chris Kenny (Stephen Last 88), Jonny Bonner, Shane Dunne (Danny Ledwith 90+3), Paul Murphy. Shamrock Rovers: Craig Hyland; Simon Madden, Robert Cornwall, David Webster (Sean Boyd 82), Gavin Brennan; Killian Brennan Pat Cregg; Gary McCabe (Danny North 71), Brandon Miele, Dean Clarke; Gary Shaw. Email “Rovers lose pace in the title race as Wexford pick up valuable points”. Feedback on “Rovers lose pace in the title race as Wexford pick up valuable points”.